The age old arch nemeses, eBay vs. Amazon. We wrote an article comparing the two marketplace giants earlier this year, and now with the official launch of Amazon Prime in Australia today, just three weeks after eBay announced their new membership subscription service eBay Plus, the two go head to head again. So what exactly does Amazon Prime in Australia include (spoiler alert: it’s not the same as the US), and how does this compare with eBay Plus for shoppers and sellers? Read on as we spill the beans. Amazon Prime is a subscription service to the Amazon marketplace which offers benefits including TV and music streaming, free and fast delivery (same day in some locations), and special deals. Amazon Prime has over 100 million members worldwide and in the US Amazon Prime members spend nearly double that of non members. Following on from the ‘soft’ launch of the Amazon Australia marketplace in December last year, Amazon has ‘slowly’ rolled out additions to its offering including Fulfilment by Amazon (FBA) in February and now, Amazon Prime. Reports earlier this year had the Amazon Prime launch pinned for July; however with the recent changes to Australia’s GST tax laws which Amazon has responded to with a new policy blocking Aussies from shopping on the US site from July 1, bringing the launch forward may have been a strategic move to shift demand back to the local platform. The Australian version of Amazon Prime isn’t quite what it is in the US and is being introduced at half the price of the US version—just $AU59/year compared to $119/year for our North American friends. This makes sense when you consider that the Australian marketplace is still in its infancy with just 60 million products available compared to 500 million in the US. It will likely take a little while for Amazon Prime to gain momentum in Australia, although the launch of their 360 degree advertising campaigns will go a long way to help speed up adoption. Shoppers can try before they buy, or in this case try as they buy with a 30 day free trial of Prime and those who sign up will enjoy a discounted promotional rate until January 2019. If you’re an Amazon seller and you want your products to be eligible for Amazon Prime, the rules are simple: you must have stellar seller metrics and be using FBA. To learn more about how to achieve good seller ratings, win the Buy Box and a whole host of other Amazon hacks, download our guide Everything You Need to Know About Amazon Australia. 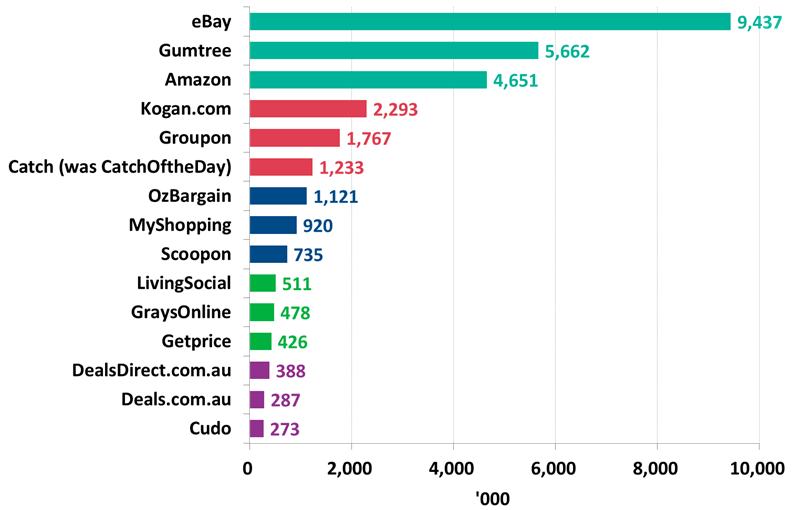 New research by Roy Morgan has revealed that eBay is still the number one online shopping site in the eyes (and fingers) of Australians, with an average of 9.4 million Aussies visiting the site over a four week period compared to just 4.6 million visiting Amazon.com.au. But despite their headstart with Aussie shoppers, and claims that they are not concerned about competition from Amazon Australia it would be silly to say that eBay is not keenly aware of the threat Amazon poses, evident particularly in their launch of eBay Plus, their answer to Amazon Prime. eBay Plus is a membership package that includes similar (but not the same) benefits as Amazon Prime to its members for $49/year (a neat $10 less than Prime). The introduction of eBay Plus comes after the roll out of eBay Guaranteed Delivery earlier this year, gives shoppers more control over shipping, allowing them to filter products by four days or less, making the eBay marketplace even easier and more convenient to use. Not selling on eBay yet but keen to get started? Read our blog post first How to Sell on eBay and then start a free trial on Neto, to see how you can manage your ecommerce store and marketplaces from the one platform. Sorry, no winners and losers here; both Amazon Prime and eBay Plus serve as beneficial and rewarding subscription services for shoppers, allowing them to save on hefty delivery costs that can stack up, and access special products and promotions. For sellers, both of these services also mean access to a loyal customer base of shoppers who are actively looking for products and tend to spend more, which saves you money on things like marketing, loyalty programs and technology. Whether you're ready to reach more customers through Australian marketplaces, you want to test international markets, or are interested in incorporating marketplaces into your strategy but you're not quite ready to dip your toe in the water, download our Free Report: Selling in Online Marketplaces in 2018 to get the lowdown on 17 Australian and global marketplaces.